I just want to let EVERYONE know of my beyond horrible experience with Empire today. I have been a long time repeat Customer who has spent $40-$50k with them over the last 5 years between my two homes. Everything in our first house went perfect, couldn't have asked for more. Our second home, trouble from day one. We stuck with them though because they always stood behind their product and gave discounts when appropriate (like when it took almost 1 year to get our Plantation Shutters), so we continued. 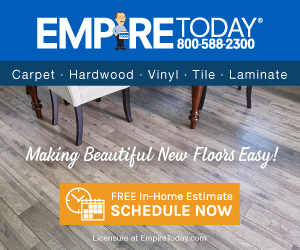 Just recently they installed hardwood floor in our family room and master bedroom, at first we were very pleased, so please in fact we had them come back and install hardwood in our guest room and our upstairs hallway. Well after a week or so, I guess once all the glue was completely dry we started to find boards that were loose, hollow underneath (no glue) and that our floor was very wavy. After numerous calls and complaints they finally sent a "supervisor" to see the work. he agreed it was not done properly and they agreed to tear up almost 600 square feet and replace at their expense. Since they stood behind their product we decided to extend the hardwood into our front foyer. When the crew finally showed to start the tear out they sent two people (2), only 2 to tear up 600 feet and reinstall that plus another 200 (ish) square feet which had tile that had to be torn up as before they could start. The installers were great, very apologetic and worked long hours to try to please us and get the job done as quickly as possible. After day one very little progress was made as this is such a chore to tear up hardwood, worse then tile and much more of a mess. I called and was told we would receive a credit and that also an additional crew would be sent the following day to speed things up. Well, needless to say, no additional people were sent to speed things up nor was a credit issued. Saturday morning comes, tile is torn up for the additional work and the installers come and say we must pay before they could start to lay down the wood. So I call the office and am told that even though 4 days had passed since I was told I would receive a credit, no one had decided how much it would be and that I needed to pay the full price or the installers would be sent home. Well, I got pissed, rightfully so, I believe because no one had done their job and decided on how much the credit would be. So after multiple arguments with multiple "managers" and me becoming increasingly angry I lost my temper and yelled/screamed, ranted and raved to no avail. FINALLY after all these calls, the original "manager" who had said the floor would need to be redone calls me. I of course have a major attitude and he asked why. I replied that you know exactly why and that if you had returned one of my phone calls over the last 5 days he would know exactly what was going on. I lost it with him and hung up on him. He later called me back and we argued, then he called me a Pr^&ck. So the call process began again and I called everyday trying to speak with a manager who could actually make a decision on what my credit should be and to complain that I was called a Pr^&ck by their "Manager" i was told everyday from the 13th of June until the 25th of June that the General Manager would be calling me, he never did until finally yesterday after another Manager (who was very nice named matthew) called and spoke with me first. He then said the GM would call me in the afternoon and he basically had been waiting to call me since my last encounter with the excellent customer service people tuned out so well. So yesterday afternoon Brian, the "GM" calls me and plays (maybe he wasn't playing) *** and tells me he has been unaware of the issues and that he did not know he was supposed to call me, even though no less then 5 managers at this point had specifically said he would be calling me. So after he calls and (plays ***) he informs me he has to call me the following day (today) which to my amazement, he did. he informs me he will give me a whopping credit of $50/day x 3 which I told him was not ok, he replied that is his standard credit. So my question is, is a Consumer who has spent $40-$50k and still has a pending order of $4700 a "standard" client or should I receive something more? For 4 days we were unable to use our home due to the mess created by fixing their poor installation, our Children had to stay in their rooms, our cats and dogs had to be locked up in a bedroom and I was unable to work from the dust and jackhammers being used (I work from home). I asked for a $500 credit which I believe to be more then fair, especially from a Consumer who has spent so much money with them and repeatedly used them and sent them business. He then said that was all he was going to do and asked if he could help with anything else. I then exchanged a few unkind words and hung up. Moral of the story - DON'T use EMPIRE TODAY, they could careless about their Clients and will scr#$w you the second they get the chance. They are a horrible company and a Nationwide Company who could careless about you, the Consumers that keep them in business. Our installers had told me it had been nearly two weeks since the last job they had from Empire Today, you would think in a slow market they would take that extra step to make you happy. THEY WON'T, they could CARELESS about you and only want to get your money, then churn and burn you. This is the reason that the excellent Management that used to be there when I had work done from them previously are all gone. Spend your hard earned money on a local small "Mom and Pop" company who actually cares about you, your satisfaction and your business. Review #279233 is a subjective opinion of mattieis.